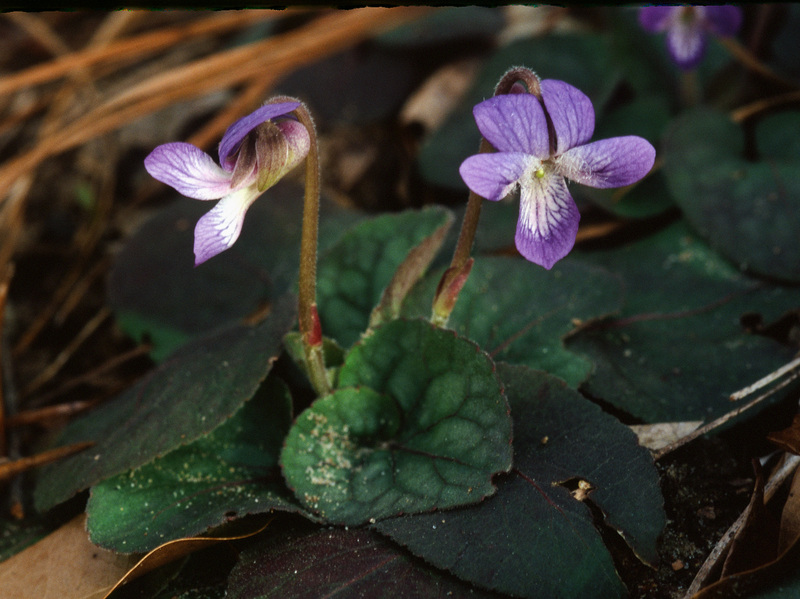 Viola villosa was first collected by Thomas Walter, a plantation owner and keen botanist in the Charleston area of South Carolina. The plants that I have photographed were growing east of Charleston at the edge of a newly developing industrial estate, at an elevation of approximately 20 feet. The extremely sandy soil was supporting stunted trees of Pinus echinata, Quercus marylandica and Q. myrtifolia but very little undergrowth. None of the violet reference books shows the correct habit of this violet. Flat rosettes of numerous overlapping leaves lie horizontally on the ground. Blue-purple flowers are born on vertical peduncles from the centre of the rosette. Two red bracteoles contrast against the paler peduncle, at about the mid-point. There are many obvious long straight hairs on the inside of the three lowest petals, and some hairs on the two top petals. The base of the three lowest petals is white, veined with purple guidelines. The flowers closely resemble those of Viola sagittata ssp. ovata. At flowering time the rosettes have three types of leaves: old persistent autumn leaves colored purple where they are exposed (but green where covered by leaf litter or overlapping leaves), maturing new season leaves that are lightly variegated and with purple veins, and the newest central leaves that are green with red-purple veins. The leaves do not look like those of a violet because the surface is not dark green or shiny. They look soft, like velvet, their very short hairs glisten in bright sunlight but are not obvious otherwise, though they soften the color to a muted mid green-purple with contrasting darker purple veins. 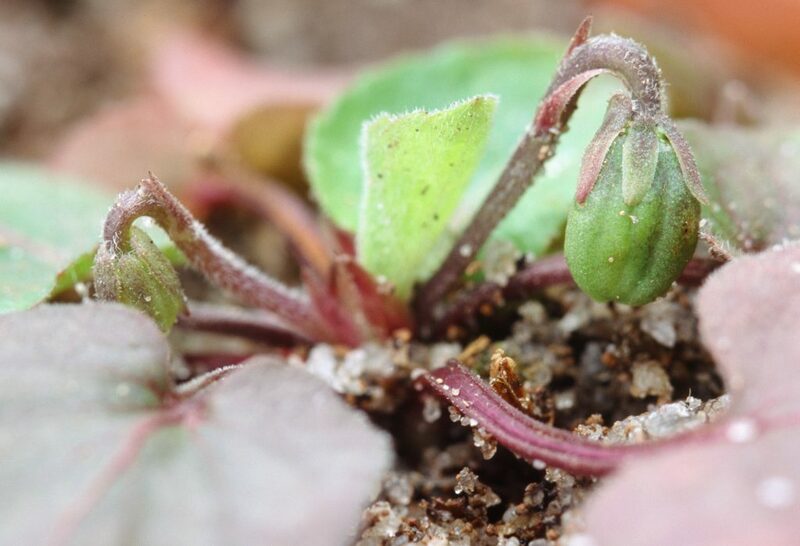 Because they are equally downy, the pink-purple peduncles and petioles also look soft. The distinguishing morphological feature emphasized in all the references is the downy pubescence on both sides of the leaves, but these hairs are actually easier to feel than to see. The habit of the plants, the color of its leaves, and its habitat of open woods on very poor sandy soil are important defining characteristics. 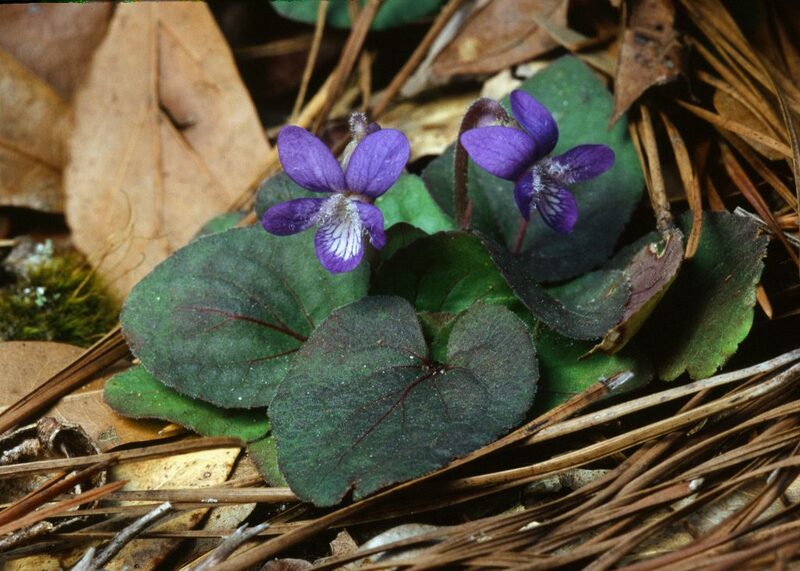 The range of Viola villosa is southern, occurring only on the Coastal Plain that spreads from North Carolina to Texas, through S. Carolina, Georgia, Louisiana, Mississippi, Arkansas, and Oklahoma; its northernmost collection was one site in southern Virginia (Gilmerton). 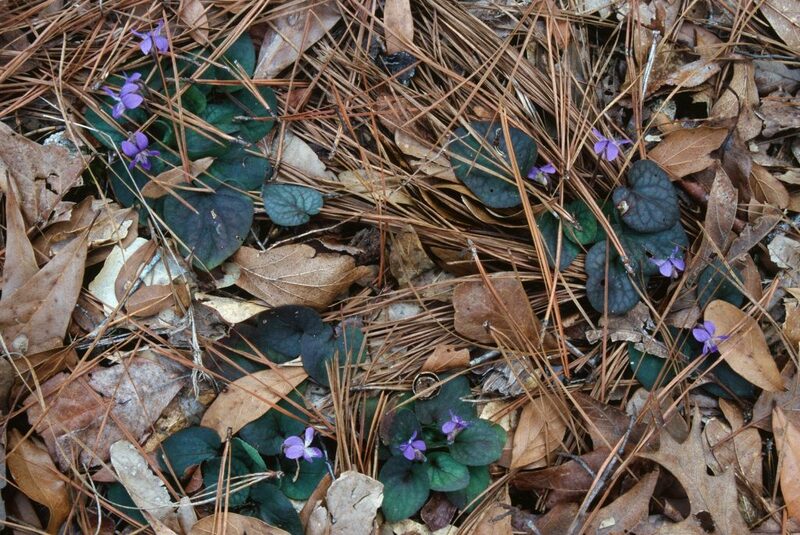 It is the earliest violet to bloom in most areas; flowering from November in pine woods in Texas, to early April in more northern sites. Although the sandy areas of Pine Barrens in southeastern New Jersey appear to be identical growing conditions, V. villosa does not extend as far north and therefore may not be so hardy. Rhizome short, vertical; roots numerous, white, relatively thick, long. Petioles inclined to prostrate, green to dark purple, short, less than or equaling the length of the leaf lamina, villous, leaf lamina margin narrowly decurrent for the whole length of the petiole. Leaves broadly ovate, villous on both surfaces and veins, tip obtuse, basal lobes short, cuneate, sinuses narrow, margin shallowly crenate; persistent leaves from last autumn are purple, except where overlapping leaves or autumn leaf litter covers the lamina, then it is green; new season leaves have red-purple veins radiating from the point of attachment to the petiole, newest leaves upper lamina green, as they age these leaves become lightly variegated because the area adjacent to the purple veins becomes darker green; lower surface of leaf lighter green than the upper surface, with dark purple veins. Peduncles very pale green-light purple to dark purple at the base, villous; red bracteoles, mid to lower peduncle, bracteoles ciliate on margins and lamina. Flowers blue-violet but sometimes paler, 1.6 cm wide x 1.8-2.0 cm long. All petals with hairs on the inside surface, only a few on the two top petals, the three lower petals covered densely with long, thin straight hairs, white on inside of lowest three petals, prominent purple guidelines on three lowest petals, purple veins on upper two petals on purple background are not as obvious; auricles and sepals ciliate on both margin and surfaces, both green with purple, more purple on auricles and top of sepals; auricles rounded; petal spur purple to white, large, rounded (globose), 4 mm wide x 3 mm long; ovary green, glabrous, style head shortly beaked; seeds pods green, glabrous. Section Nosphinium Ging., subsection Boreali-Americanae (Marcussen, 2011). Fl. Car., p. 219. 1788. 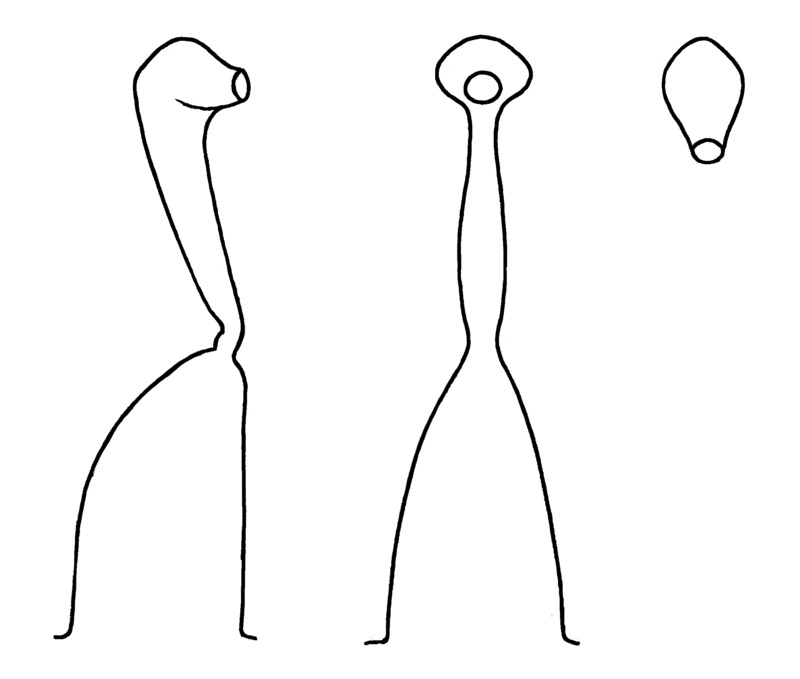 Species No. 23. Walter’s description of V. villosa was brief: ‘stemless, leaves villous cordate-ovate, flowers at times blue, at times apetalous’. Ezra Brainerd detailed the many early errors that lead to confusion between the species V. hirsutula, V. sororia and V. villosa. He wrote that ‘after repeated visits to the tide-water plains of South Carolina where Walter lived, we are confident that no other violet in those flat, sand plains answers to his concise description’. 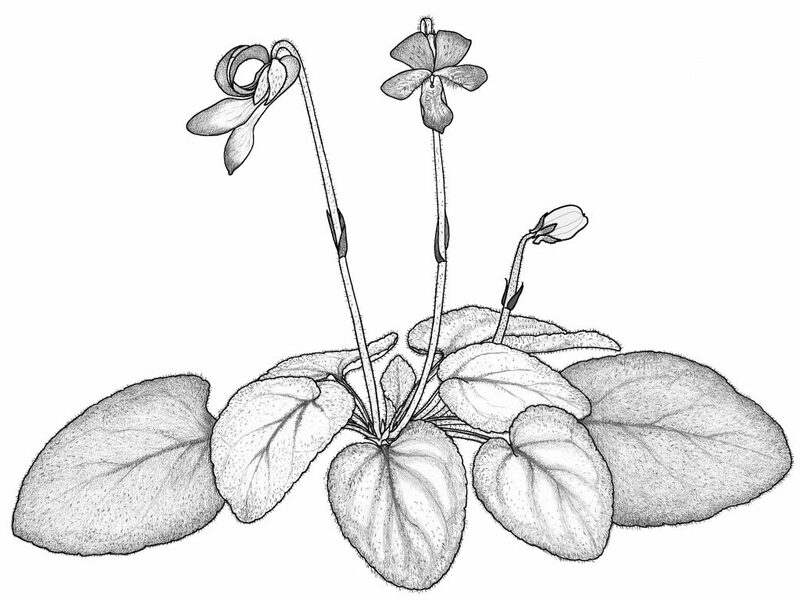 He quotes Le Conte as saying ‘When V. villosa is misunderstood it is simply by those who have never seen it.’ Viola Brainerd Baird said that ‘this is one of the most unusual and conspicuous leaf types in any of the eastern violets.’ Russell (1965), Gleeson & Cronquist (1991) and later Landon McKinney (1992) all recognized V. villosa as a distinct species. It should be noted that Gleeson & Cronquist called V. hirsutula a form of V. villosa with which none of the cited authors, nor I, agree.